The guiding principle of Buddhism is that things change – we change – and that we have the capacity to direct that change towards spiritual growth and development. In Living with Awareness Sangharakshita explores this principle progressively through the filter of the Satipatthana Sutta. Mindfulness is the means by which our consciousness is transformed, transcended, Enlightened. The Satipatthana Sutta is one of the Buddha’s foremost discourses on mindfulness. 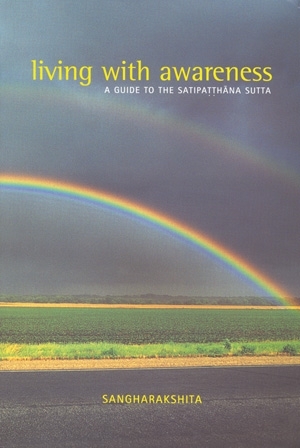 In Living with Awareness, a commentary on this sutta, Sangharakshita counsels against an over-narrow interpretation of mindfulness as being simply about developing a focused attention on the present moment. To be fully mindful, one needs to look further than the end of one’s nose, and integrate even the most rarefied practice into the context of a fully lived human life. The guiding principle of Buddhism is that things change – we change – and that we have the capacity to direct that change towards spiritual growth and development. In being mindful, therefore, we recollect not only the breadth of our current experience, but also our purpose in attending to it. Living with Awareness explores this principle progressively through the filter of the sutta.